No store item appeared where it was supposed to. This turned out to be because I forgot to create the store on the live server (oops). When the item still didn’t appear, it took a while to figure out that it was an unapproved item (until items are approved, only admin accounts can see them). I marked it approved and it showed up, and that all worked fine. No combat showed up where it was supposed to. It didn’t take as long to figure out that the combats needed approval also. One MySQL query blew up…and it was the kind I hate. You know what I’m talking about: the kind that you wonder how it ever worked in the first place. It was a quick fix. So really just one actual bug. The rest was forgetfulness and the system working exactly as it should. Since I’m largely working live now, the forgetfulness should be less of a factor. I had a really nice (and I do mean NICE) browser-based editor. When the size of the maps increased, it was just too much for that editor and I had to write another one. The new one is written in C# and makes extensive use of GDI+, and it generates much better composite graphics than I had ever been able to manage with GD2. Brother Morales – He’s the monk in the upper-right. He is the librarian, healer, chaplain, and occasional judge. He’s actually pretty low in the Atomic Order, as are all monks stationed to individual compounds and clans. He sells bandages. Chef Andy – He cooks for the clan. Nothing fancy, but lots of it. Besides cooking he’s also in charge of food production. You can buy hard bread and goat cheese from him. Mob Barley – Mob runs the still, and sells the resulting booze. He doesn’t contribute much to the clan, but people do like their hooch. There are certainly going to be other characters, these are just the three in there so far. I have (very) faint hopes of still meeting my self-imposed October 1 deadline for full beta testing, but I can’t say that looks terribly likely. I’m doing all I can on evenings and weekends, but there’s only so much a single person can do. Rest assured it IS still coming, and WILL still be done. With luck, the beta might be pushed back a little but go smoothly enough that the full launch on October 31 still happens. The code has gotten pretty stable and I’ve started spending my time writing the tutorial level. It should cover how to use the interface, how to pick perks and add attribute points, using items, how to manage combat, etc. Right after the player picks the “Ok, so let’s finish…” line, Brother Morris walks down a bit and waits for the player to come down and talk to him again (by clicking on him…see the chat cursor?). That will start the next part of the tutorial. The standard way of handling stores is to draw inventory, security, manager, entrance, and exit squares on a map. I then set up that particular map as a store map (making it a store class), and create a store based on that store class. I can then set up the inventory of that store. 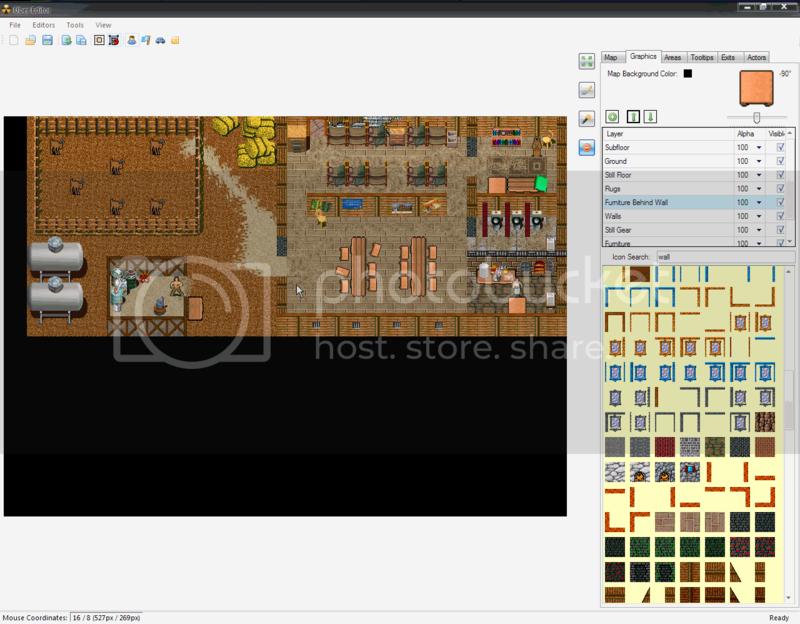 When the player selects a store from the market interface, they are actually taken to the map specified by the store’s store class. Maps used this way really can’t be used for anything else. What I added was a way to set up a different sort of store class. I can now add inventory slots to an otherwise normal map, create a special type of store class from that, and tell the map to draw its inventory. This provides store inventory slots on a normal map…you can purchase items from a normal map without “entering” a store as normal. This is really nice with the larger maps that I can make now, so the compound you start in can just have an old man in the corner selling a few things, all as part of the bigger picture. Actors (NPCs) have been very static characters. They’ve been defined and programmed, and work exactly the same way for everybody. That includes their location. If you see them standing in a corner of Casa Vista, then they pretty much had to stay there unless I wanted to write a lot of finicky script changes and store bits of data on your character. Now I can say “Hey, Mr. Actor Person, PERSIST.” That creates a copy of that actor just for your character, with its own data, reputation, and location information. Once the actor has been persisted I can move him around at will and it will stick without me having to jump through any hoops. And since I can also stash any arbitrary data with him, and his scripts are part of him, I can pretty well define his complete set of behavior as a single unit. Spiffy! That’s enough for now…back to work!